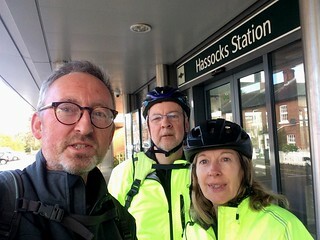 The 3 of us paused for a group selfie outside Hassocks Station, wondering if our fellow Clarionisters had been deterred by the showery weather forecast, which proved to be a fine example of fake news, perhaps because we were north of the downs. Graham led Nick and me off towards Hurstpierpoint, where a small crowd had gathered at the crossroads outside the church to mark the 100th anniversary of the end of WW1. We paused to observe the 2 minutes silence and hear the traditional bugle rendition of The Last Post before continuing on to Washbrooks Farm for our coffee stop. We were rather impressed by the magnificent pumpkins on display, but completely blown away by the silver sparkly toilet seats, unfairly only available in the women’s toilets. Blue skies and wispy clouds contrasted with the golden autumn foliage and leaf fall as we continued along the B2117 and on to the quieter Shaves Wood Lane, then north towards Twineham. 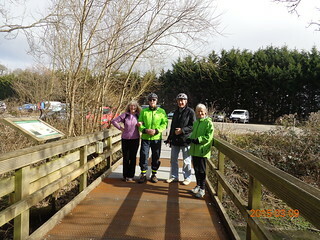 A traffic-free lane led us along the final stretch to our lunch stop at The Sportsman Pub. 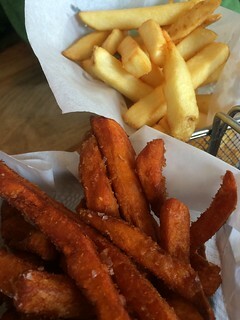 We were impressed with the quality of our food choices. Graham’s Nut Roast was served with beautifully cooked veg, my chips were served with a complementary side order of Cumberland sauce but Nick surprised us all by going crazy with an order of sweet potato chips, which came with a complementary side of braised carrots and parsnips. In honour of Julian, we perused the extensive dessert menu before returning to our cluster of bikes and heading off on the last leg of our journey. More quiet roads and country lanes took us past Hurstpierpoint College on our return to Hassocks Station, where we waited about 2 minutes for the next train, which was a direct service to Brighton. 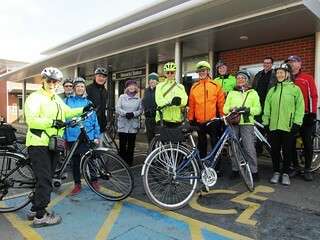 Thanks a lot Graham for leading us on this enjoyable ride, which fortuitously avoided the blustery showers forecasted for Brighton. On a crisp February morning, at the somewhat luxuriously late hour of 11am, eight cyclists stepped off the Bedford train at Hassocks and met with a ninth who had arrived by other, undisclosed, means. And so the Nine Riders set off on their grim pursuit of the One Ring, the Ring that … oh, hang on, that’s the wrong story! Angela D, David, Jim, Peter, Richard, Sikka, Tessa, Wendy and Wilma came just to enjoy a nice ride, beautiful scenery, stimulating conversation, and some well-earned refreshments at the end of the ride. 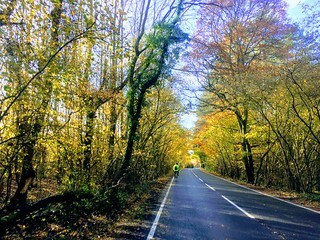 After dodging cars between Hassocks and Ditchling, Spatham Lane brought a welcome quiet and the chance to ride two abreast and natter. Then off-road on the farm track to Hayleigh Farm and beyond. The view across to the South Downs from this track is utterly breathtaking. We looked in vain for landmarks, but saw none except a curiously shaped wood on the scarp slope that takes the form of a giant letter V. Sikka explained that it is thought to stand either for Queen Victoria, or possibly for Victory. Unfortunately a photo was difficult to obtain because of the sun behind it, so I contented myself with a south-westerly view of a bare tree against the backdrop of the Downs. Later we encountered a certain amount of mud. A certain amount is OK, but more than that can be unpleasant. It was for this reason that we eschewed the northbound track from Hayleigh Farm in favour of the easterly route to Streat Church; the former track was pronounced too “mushy” by our valiant leader – and thus another word enters the Clarion lexicon. We saw many other cyclists during the ride – some of the speedy Lycra set, and others going at a more leisurely pace. Most seemed in quite good humour, but one of the former group definitely wasn’t. As he approached us at speed in Chiltington Lane, he snarled “Get off the f___ing road!” OK, we were, perhaps, rather spread out laterally across the lane, but we would have let him pass anyway without such rudeness. His remark was for me a chilling echo of that uttered by a cyclist in London who, seconds later, hit and killed a pedestrian two years ago. I wondered how many cyclists there are out there who, untrained in road use, believe that they have some kind of monopoly of the road. 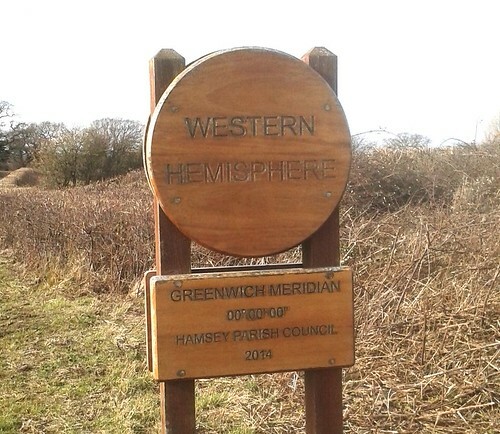 On to Cooksbridge, then a little detour along Hamsey Lane to avoid a section of the A275, crossing briefly into the Eastern Hemisphere at the Greenwich Meridian on the way. Rejoining said road at Offham, we were able to ride along the pavement until we got to the turn-off into Offham Road, where it was safe to re-enter the carriageway. On the way, Peter, Wendy and I stopped to look at the old Offham Chalk Pit which used to send lime down tunnels under the road to barges waiting on the river Ouse. 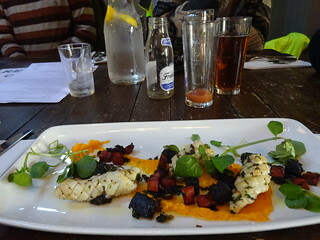 And so at last to lunch, at the John Harvey Tavern in Lewes. The food was excellent, and we agreed that there was something to be said for having the lunch at the end of the ride rather than in the middle, when the thought of getting up and cycling another 10 miles can be rather daunting on a full stomach. Conversations over lunch and on the ride covered such topics as future rides, the Easter Meet (Wendy and I may go for the “social rides” … anyone else up for that?) and possible future weekend rides. We have not done one of these since 2014; there was a suggestion of a return to Kent, or another re-run of the New Forest, or even another trip to France. But my favourite option would be a repeat of 2012’s Bath-Bristol weekend, augmented this time by the Two Tunnels Route, which opened a year after that last trip. What does everyone else think? We raced to the station, with Tessa, Peter and me just catching the 16.22 train, and the others no doubt not far behind. Thanks to our joint leaders, Tessa and Sikka, for another most enjoyable Clarion ride. Well, we were just a little band of four today as Ian, Julian, Delia and I left Hassocks station on a warmer than usual December morning. 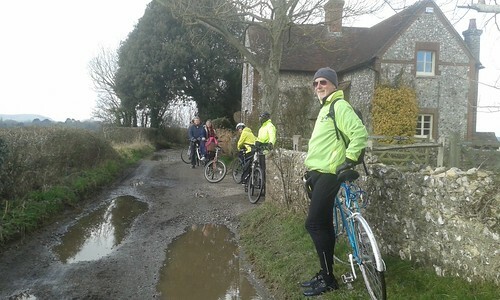 We followed a familiar route out towards Hurstpierpoint where hymns could be heard as we cycled past the church at the crossroads in the village. The congregation was certainly ‘giving it their all’ for us to be able to hear them from the roadway. 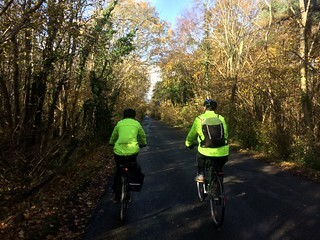 Then, on through Albourne towards Twineham through some very pretty lanes where Julian identified the birdsong of a green woodpecker, robins and possibly a song thrush, who were also ‘in good voice’. At this time of year the winter landscape allows views through the trees that, of course, with trees covered in their summer leaves, you do not see in other seasons. Between Twineham and Wineham, (what a lovely rhyming couple), we had a view of something unexpected, a massive electricity sub-station which crackled its energy supply along the wires between the concrete supports. Not the prettiest of sights, but at least it is out of view for that part of the year when the trees are in leaf. 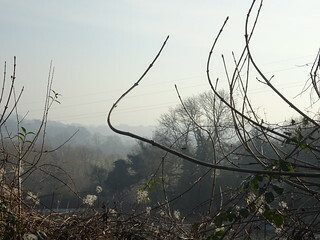 Other views through the trees were more pleasing to the eye – the wintry, grey outlines of the Downs and a patchwork of pasture and arable fields. Always along these routes are some very pretty houses and cottages and also some very large properties which I often find make me wonder what people do for a living to own such large places. Well, Ian came out with a theory that made us all laugh. He reckoned that many were owned by retired drug dealers who, having evaded the law, wanted a quiet life in the country in their old age! At Twineham we stopped for lunch at the Royal Oak which, according to the landlord, dates back to the 16th Century and has been a pub for over 200 years. The historic building prompted a conversation about the dangers of travelling by horse drawn coaches back in the day of highwaymen. Ian, Delia and I have been watching the recent programmes on the tele about smugglers, pirates and highwaymen and the dastardly deeds they got up to. Worth a look on the iplayer if you haven’t managed to see them. After lunch, (three delicious plates of ploughman’s and one bowl of spiced carrot soup), we began the journey back through Woodmancote towards Albourne and Hurstpierpoint, and we decided not to stop for tea as the light was beginning to fade and Delia was concerned that I do not have any lights on my bike. So, we got back to Hassocks mid-afternoon in order to make our way home after a very pleasant winter ride and even more pleasant conversation. Thanks to Ian for organising and leading the ride and may he and all other ‘Clarionistas’ have a very lovely Xmas and I look forward to a New Year of many more rides. Since our usual end-of-the-year ride – the short circular based on Berwick – is not possible because of lack of train availability, I’ve been thinking about an alternative – short and easy – substitute and this is what I’ve come up with. 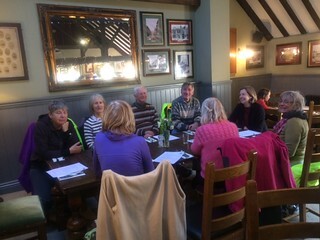 We meet at Hassocks station and make for Hurstpierpoint, Albourne and High Cross, taking the Twineham road as far as Twineham Green, then along Bob Lane to Wineham and (an early) lunch at the Royal Oak – always a favourite stop. Back at High Cross on our return leg, we’ll take the road down to Shaves Wood then the B road back to Hurstpierpoint with a possible tea stop at Washbrooks Farm before returning to Hassocks. Catch the 10.14 from Brighton station or meet at Hassocks station at 10.23. Best trains from London would be the 9.36 from Victoria – arrives at 10.37 – or the 8.56 – arrives 10.41 from London Bridge. It always takes a while for us to get going but if you’re planning to take either of these routes please let me know so we can be sure not to start without you. My mobile number is 07770743287 and it will be switched on (!) as soon as I get to the station. Do check your emails at 5 pm the day before – if the weather looks like being grim I will cancel/postpone. 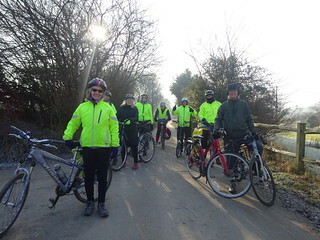 Sunday’s Clarion ride, organised by Mick and Anne, took us from Hassocks railway station via Woods Mill Nature Reserve and Poynings in pleasant morning spring sunshine, followed by cooler and more overcast weather after lunch for the return ride to Hassocks. The Hassocks Clarion fifteen gathered outside Hassocks railway station were: Anne, Mick, Helen, Dave, Joyce, Leon, Chris, David, Sikka, Angela, Rob, Julia, Corinne, Nick and Sean. Mick suggested a brisk pace for the cyclists in order for us to arrive at the lunch stop in Poynings as close to noon as possible.The Royal Oak were trying to accommodate our group ahead of the busy Sunday lunch trade. Sussex Wildlife Trust’s Woods Mill Nature Reserve was a popular first stop of the day. 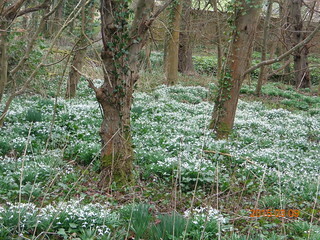 There were plenty of snowdrops on display close to the nature reserve pond. 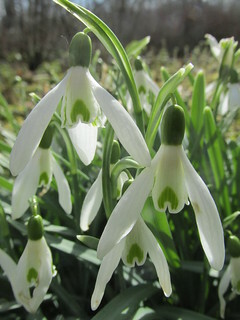 Although we could hear plenty of birdsong, we had limited time to explore the variety of wildlife in the nature reserve. It would be good to return again in the future to see the nightingales, woodpeckers, warblers, turtle doves and dragonflies listed in the Woods Mill Nature Reserve information sheet. The Sussex Wildlife Trust had a number of free pamphlets for visitors to take away. I picked up information leaflets on urban foxes, squirrels and Ditchling Beacon Nature Reserve (also run by Sussex Wildlife Trust). The next planned stop after Woods Mill Nature was the lunch stop at the Royal Oak in Poynings. There was a slight delay reaching the lunch stop due to problems with Sean’s bike chain. 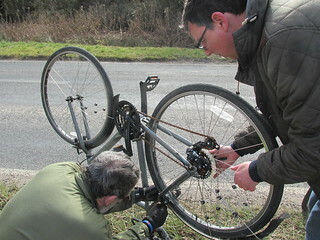 Dave was able to fix the twisted chain during an emergency roadside repair, while I took a few photos. Sean’s pitstop bike repair resulted in some of us arriving later at the Royal Oak than was planned. We spent lunch in an upstairs function room, away from the very busy bar downstairs. 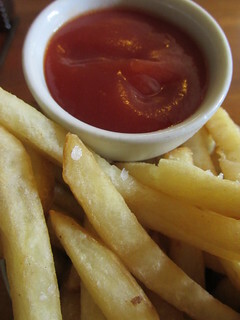 I dined on chips and ketchup, but there were more exotic dishes available (the soup option favoured by some looked particularly appetising). Joyce did a fine job working through the till receipt at the end of the meal to decide how much we each needed to contribute to the bill. Despite lunch taking longer than some previous Clarion meal breaks, we still had time for a tea-stop later in the afternoon. With photographs of animals on the walls to remind us we were in a farm, we spent thirty minutes in Washbrook Farm drinking tea before heading back to Hassocks railway station. Sean spotted a reasonably well-known BBC TV football pundit as we cycled through the mean streets of Hurstpierpoint. We were still trying to remember the name of this mystery football presenter (Jonathan somebody?) as we waited for the train at the end of Anne and Mick’s excellent bike ride. 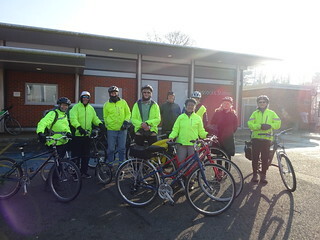 Six members (John Clinton ride leader, Joyce, Julian, Rob, David and Leon) grouped at Hassocks railway station. 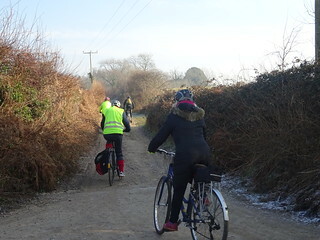 After taking the usual group photos we set off at 10.30am in high spirits toward Hurstpierpoint turning north into College Lane and then onto Danworth lane where we encountered some broken ice covering parts of the lane in low areas, unfortunately Julian slipped and fell, injuring his left knee. After a short rest he mounted up and continued riding. The night before temperatures dropped to about -6C in mid-Sussex so we should have expected some slippery lanes. 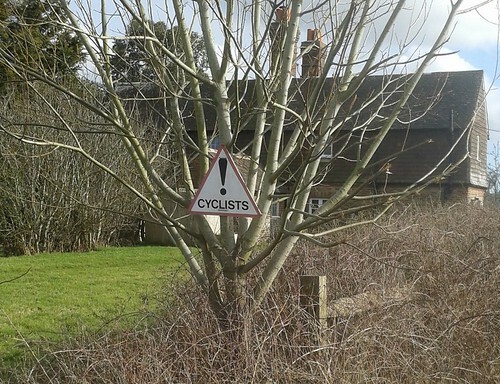 No further instances occurred and we rode on to cross the A272 at Bolney. The gentle slopes of mid-Sussex blended with the mid-Sussex ridge where Joyce started to dismount and walk some short sections. Just a short run up to the Bolney Stage PH for lunch was a few minutes away for our six cool riders. While parking our bikes Rob produced some white plastic saddle covers for each of us but, here we come into our own with special tomfoolery and the covers were swiftly adorning our heads (see photo). 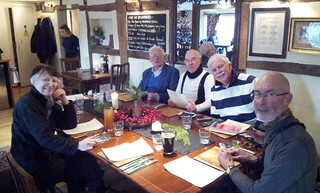 We were greeted, seated and presented with the menu even though the dining areas were quite well occupied. Our meals soon arrived and enjoyed with plenty of pleasant conversation and laughs. We all enjoyed our meals and about an hour and a half later we returned to our bikes for the return journey. Lights went on, and off we went, mostly downhill returning on the same route as far as Goddards Green where Leon offered an alternative via the Burgess Hill Green Crescent that brought us out onto the London road cycle route between Burgess Hill and Hassocks where it started raining. We split-up at this point because John was to ride back to Brighton, Rob went east to Ditchling where he left his car and four headed back to Hassocks station to complete the circle. Our thanks to John for planning and leading this ride.